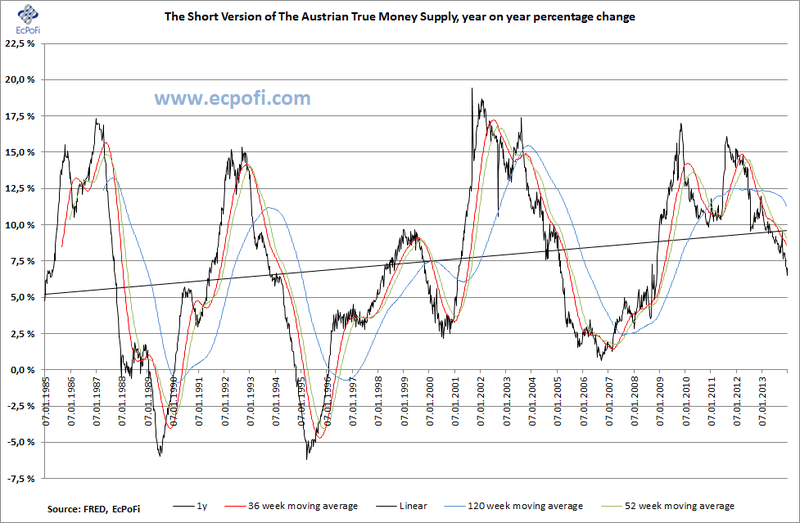 The short version of the Austrian True Money Supply (SVTMS) for the U.S. increased by 0.47% (27.41% annualised) during the most recent week ending 6 January to reach US$ 9.9397 trillion calculated from the most recent monetary statistics published by the Federal Reserve. Click here to access weekly reports since August 2013. The 1-year growth rate in the money supply increased from 6.52% last week to 7.03% this week. The growth rate remains however among the lowest it's been for more than five years and continue to come in substantially lower than one year ago. 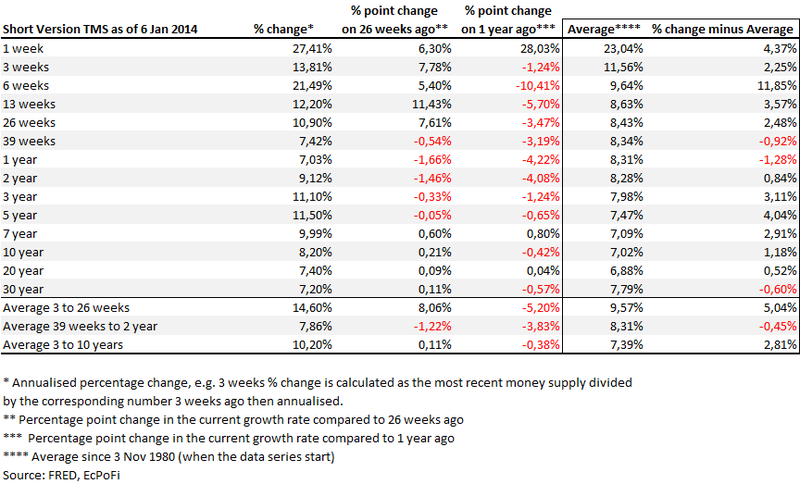 The 5-year growth rate (annualised) also increased for the week, from 11.21% last week to 11.50%. The growth rate is however 65 basis points lower than at the same time last year. The 5-year growth rate (annualised) is hence continuing to decline compared to one year ago and it's been in negative territory now for six consecutive weeks (see the black line in the chart below). The last time this happened was week ending 19 September 2005. Most growth rates are continuing to decline compared to one year ago indicating money supply growth has been slowing down. For example, the current 1-year growth rate of 7.03% is 4.22 percentage points lower than the same week last year while the current 39-week growth rate (annualised) is 3.19 percentage points lower. 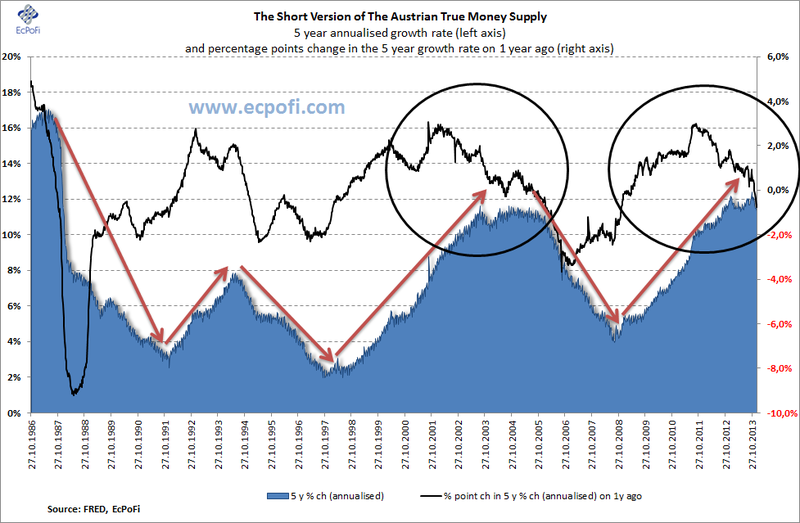 Go here for annual data since 1981 for the short version of the Austrian True Money Supply.